Turkey is one of the most delicious meats on the planet! So why not try smoking an entire turkey on your pellet grill? It may take a good chunk of time, but if you follow our secret recipe below, you will smoke the most delicious turkey you have ever tasted. Follow all of the instructions. Cooking a turkey, especially smoking one, takes quite a bit of time when compared to other meats. The good news is, it is totally worth it because the bird holds a lot of meat and there will definitely be some leftovers once you are done. That being said however, we recommend getting a small bird as this will take less time than cooking a huge one. If you are smoking a turkey, chances are this is not your Christmas or Thanksgiving turkey, so you can afford to buy a smaller one for this. The first thing that you are going to have to do is thaw the turkey, as usually you will buy one frozen. It is crucial that you completely thaw it out because it needs to be completely thawed before you can cook it. This can sometimes take over four days, so we recommend planning it advance and knowing when you want it thawed out. Once thawed, remove the neck and the organs from the inside of the bird. These are usually found in a bag inside the cavity. If you do find that you do not have a pan large enough for the turkey, you can actually smoke one in a 5-gallon pail that you can pick up from a local hardware store. Fill the pail with water and put the turkey in it. Now it is time to season the turkey and you can leave it in the water and add salt to it. Add a raw egg and 3 tablespoons of brown sugar in the water. Also add 5 tablespoons of the poultry rub that you have chosen. For the garlic, use a press and put several clovers right into the water with the turkey, and stir it. You will leave the turkey overnight; this is called the brining process, and you must leave it fully submerged overnight. The next day, remove the turkey and pat it down with a paper towel to dry it off. Before you get cooking, rub it down again with seasoning, wherever you can reach. This is going to make it taste amazing, You want the skin to be fully coated in the rub you have chosen. When the turkey is ready, placed it breast-side down in a pan in the pellet grill. If you have a turkey oven roaster, you can feel free to use this too. Turn on the grill and set the temperature to 185°. When it reaches this temperature, you can put the turkey on the grill. This is where you use the apple juice and the Worcestershire sauce; mix the two together and put it in a small spray bottle. 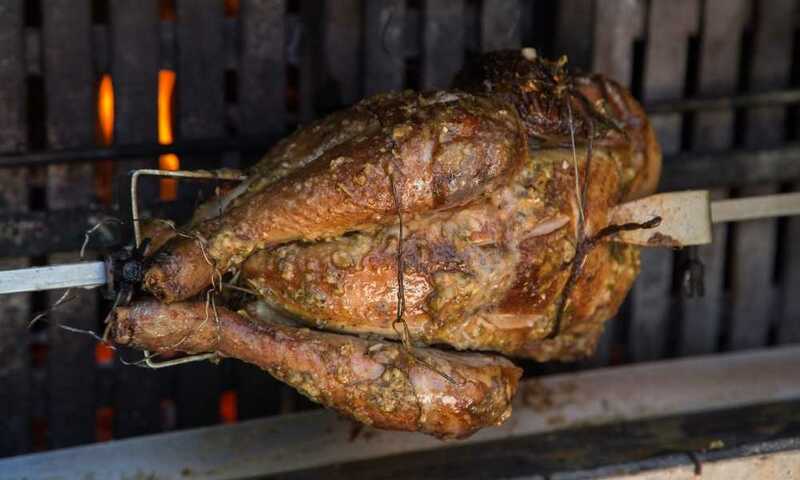 Once every hour, open the grill and spray the turkey thoroughly with this mixture, especially inside all of the cavities. This is going to add a flavor and keep the turkey moist and delicious. If you really love the apple flavor, you can double down and even go with apple wood pellets, to give it that extra kick. Now just to warn you, this is going to cook for about 8 hours, no matter the size of the bird! Once the 8 hours is over, check to see the internal temperature of the meat. It should reach 160-165°, and then it will be done. It is time to feast for days with all of the meat you are going to have. When cooking and smoking a turkey on a pellet grill, we recommend that you prepare yourself with a lot of patience. It does take time, but it is completely worth it. You are going to understand us better once you try it and taste it for yourself. You need to cook the turkey slowly to keep the juices in, and ensure that it tastes delicious. Bon appetite! Hey, I like your Blog Post. I recently wrote an post on preserving food. I love to make my own meat for New Year!. I will be making a nice pudding to go with it. The children will be on holiday and I am sure they are going to enjoy it.